Post a picture on our Facebook page of a friend who you think needs and deserves the personal styling and shopping experience. The Afternoon Express Ticket competition ("the Competition") will be run by Cardova Trading Proprietary Limited (registration number: 2010/007686/07) (“the organisers”) and the prize is provided by Yolisa Mqoco and Afternoon Express, the organisers of the shopping experience titled Win A Shopping Experience with Yolisa ("The Promoter"). • By entering the Competition entrants agree to be bound to all the terms and conditions and competition rules as set out herein. • The Competition is open to all Johannesburg citizens who permanent residents of the Gauteng Province who permanently reside in the Republic of South Africa, except directors, members, partners, employees, agents of, or consultants to the organisers, the Promoter, or any other person who directly or indirectly controls or is controlled by the organisers or Promoter, including their immediate family, business partners or associates, or any supplier of any goods or services in connection with the Competition. • Entrants under the age of 18 must be assisted by a parent/legal guardian, who approves of, and consents to the entrant’s possession and use of the prize, should he/she be selected as the winner. • The competition will open on 27 September 2016 at 17h00 and close on 29 September 2016 at 18h00 ("the Competition period"). • To enter, entrants must nominate a friend who they think needs and deserves the personal styling & shopping experience with Yoliswa by sending in a picture of their friend on Afternoon Express Facebook page. • There is no restriction on the number of entries. Entrants may enter as many times as they like to increase their chances of winning. • 1 winner will be selected by Yoliswa based on the pictures that are sent and posted on our Facebook social media platform, from the valid entries received within the Competition period on the closing date of the Competition. Late entries will not be considered. • The organisers may at its sole discretion announce the name of the winner drawn on Afternoon Express. • In case of a dispute regarding the identity of the winner herein, the owner of the Facebook account used to enter the Competition will be deemed the winner, even though the account may have been used by another individual to enter the Competition. • The organisers will contact the winner telephonically on the number from which the entry was sent and shall make at least 5 (five) attempts to contact the winner. • If the organisers are unable to contact a winner within 2 (two) business days from the date the winner is drawn, that winner will forfeit the prize and the organisers reserve the right to select a new winner under the same conditions, except that the organisers will make 1 (one) attempt only to contact each further entrant selected until a winner is declared. 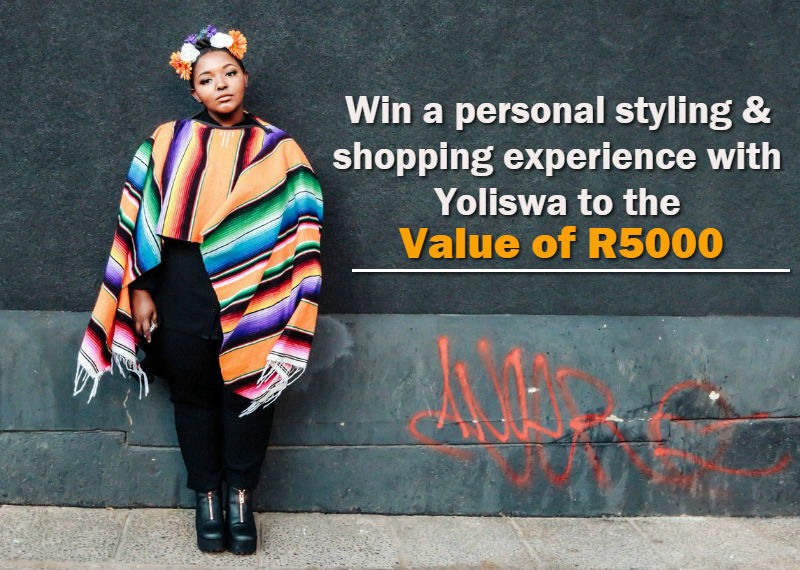 • The prize is: The 1 winner will receive a R5000 Woolworths gift card, for a shopping experience and lunch at a Woolworths Cafe with Yoliswa provided by Afternoon Express and Yoliswa Mgoco• The prize is not transferable, and cannot be deferred or exchanged for cash or any other item. • The organisers will deliver the prize to the winner within 21 (twenty-one) days from the close of the Competition. Should the winner fail to claim or accept the prize within 21 (twenty-one) days from date of notification, or if the winner fails to provide sufficient identification documents, the prize will be forfeited and the organisers shall be entitled to award the prize to the next eligible winner under the same conditions. • Winner will use the prize at own risk. The organisers, the Promoter and their agents shall not be liable for any loss (including, without limitation, indirect or consequential loss), damage, personal injury or death which is suffered or sustained (including but not limited to that arising from any person's negligence) in connection with this competition or accepting or using the prize or any part thereof. • The organisers and their agents will not be liable for any damages, compensation or the like arising from any disqualification for reasons described in the terms and conditions. • The organisers and their agents accept no responsibility for any technical problems with respect to entries, or any late, lost, incomplete, misdirected, incorrectly submitted, delayed, illegible or corrupted entries. The organisers and their agents are not liable for any costs incurred, responses received or any other consequences of user error. • The organisers' decision regarding any matter concerning the Competition and/or arising out of these terms and conditions, as well as the selection of the winner, is final and no correspondence will be entered into. The organisers and/or their agents will not be held responsible for any disputes arising from the Competition or prize awards. • The organisers and their agents reserve the right to cancel, modify or amend the Competition at any time without notice to the entrants, if deemed necessary in its opinion, and if circumstances arise outside of their control. The organisers shall further be entitled to change the prize herein to a prize of similar or greater value. • The organisers do not warrant the any prize is free of defects, whether latent or patent, and further ore that it will be fit for a particular purpose. The organisers will accordingly, otherwise than allowed in law, not be liable in the event of the prize having any kind of default or causing any harm. • Proof of South African identity will be required to collect a prize and the organisers reserve the right to cancel any award to a winner if that winner fails or refuses to provide sufficient documentation to verify his/her identity within 21 days from the determination of the winner. • These terms and conditions will be construed, interpreted and enforced in accordance with the laws of the Republic of South Africa.